Biography of Mannerist Painter, Pupil of Raphael. Church of San Maria dell'Anima, Rome. One of the great Old Masters of the cinquecento, the Italian painter, architect and designer Giulio Romano began his career in the workshop of Raphael (1483-1520), where he rose to become chief assistant, and on his master's death, chief executor. After 1525, he broke free from the influence of Raphael to set the stamp of his own powerful personality on the new style of Mannerism, which displayed a liberated attitude to classical influence. During a relatively short career, spanning less than half a century, Giulio Romano became an influential figure in Mannerist painting, especially in Mantua, where he became chief painter and architect at the court of the Gonzagas. During his time in Mantua, Romano succeeded in spreading Raphael's formal principles of art throughout northern Italy, but also achieved international recognition for his own independent works. A master of mural painting, he is best known for his trompe l'oeil frescoes in the Palazzo del Te (1525-35) and the Ducal Palace in Mantua, as well as the Papal Apartments and the ceiling of the Villa Farnesina in Rome. His panel paintings included masterpieces such as The Martyrdom of St Stephen (1520-5, Church of San Stefano, Genoa - according to Vasari, "Giulio never did a finer work than this"); The Holy Family (1522, Church of San Maria dell'Anima, Rome); Virgin and Child (1520-5, Uffizi, Florence); and Madonna with the Washbowl (La Madonna della Catina) (1525, Gemaldegalerie Alte Meister, Dresden). By the time he died, he was one of the most famous Mannerist artists of the day. Born Giulio Pippi, in Rome, one of very few High Renaissance artists to be a native of that city, Giulio Romano was apprenticed to Raphael from about the age of 13, although - given his swift rise - it may have been earlier. At any rate, he so quickly mastered the principles of drawing and painting, as well as the preparation of colour pigments, that he became Raphael's most important pupil and his favourite assistant. Even so, neither the exact scope of his workshop duties, nor the details of his contribution to Raphael's Renaissance paintings, is entirely clear. What is known, is that he became Raphael's right hand man, and that the workshop handled more prestigious commissions - for fresco murals, altarpieces and panel paintings - than any other in Rome. Giulio Romano's career as a painter falls into three phases: first, his contribution to the paintings in the Vatican, and other works, up until the death of Raphael in 1520; then, the completion of unfinished paintings by Raphael, up until about 1524, when he left Rome for Mantua; finally, a new period of activity at Mantua where he was introduced by Baldassare Castiglione to Federigo Gonzaga, the son of Isabella d'Este, who entrusted him with the monumental task of decorating the Palazzo del Te, as well as a number of architectural design projects. In 1515, Giulio Romano contributed some of the preliminary drawings for a series of tapestries of The Acts of the Apostles, based on ideas put forward by Raphael. He also translated some of Raphael's cartoons into the frescoes of the Sala del Incendio (The Battle of Ostia, 1515-16). At the same time he was working on decorations for the Loggias, for which he designed a series of some 50 scenes from the Old Testament. Small in size and contrasting in style, these are linked by a play of stylized motifs known as "grotesques"; at the time these were highly original although they have now become part of the universal vocabulary of ornament. Romano was also responsible for a major part of the frescoes that make up the Story of Psyche on the ceiling of the Villa Farnesina - again carried out from Raphael's preliminary sketches (1518). 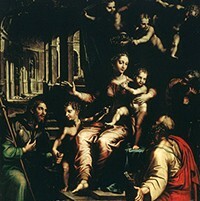 He also worked on several works of Raphael's later religious art, such as The Ascent to Calvary (Prado), The Holy Family of Francis I (Louvre), The Stoning of St Stephen (Church of S. Stefano, Genoa) and various works of portrait art (Joanna of Aragon, Louvre; Fornarina, Pushkin Museum of Fine Arts; Baldassarre Castiglione, Louvre). Following Raphael's death in 1520 (Romano was himself only 20), Giulio became his master's principal artistic executor, taking over responsibility for the completion of numerous works, including Raphael's Coronation of the Virgin and The Transfiguration in the Vatican. In addition, he finished the decoration of the Loggia of the Villa Madama in fulfillment of the original commission from Cardinal Giulio de'Medici in 1520 - a task in which he collaborated with Giovanni da Udine. The same patron, now Pope Clement VII, was anxious to finish the decoration of the Papal Apartments begun by Raphael (for details, see: Raphael Rooms, Vatican), and thus entrusted Giulio with the frescoes in the Room of Constantine (1523-25). These vast, overflowing compositions, with their subtle linear perspective, recall Giulio's paintings of the same period, such as The Madonna with Cat (Capodimonte Museum, Naples), and The Holy Family and Saints (Church of S. Maria dell'Anima, Rome). Obviously Raphael was a hugely important formative influence on Romano, who remained an important follower for the rest of his life: see, for instance, Raphael's characteristic 'pyramidal' arrangement in Romano's 1522 painting The Holy Family. Romano's muscular style of painting also borrowed heavily from his celebrated elder contemporary Michelangelo (1475-1564), whose Sistine Chapel frescoes were a model for figure painting at the time. Nonetheless, as the cinquecento progressed, Romano evolved his own signature style, characterized by a vibrant colour palette and bold figurative style - less subtle than Raphael, more illusionary than Michelangelo. In the field of architecture, Romano was strongly influenced by Donato Bramante (c.1444-1514) and, in particular, the latter's ability to surprise and shock the observer. The latter part of Giulio Romano's career in Mantua and elsewhere, was devoted to architecture, although he also continued to work as a painter. He rebuilt the Ducal Palace in Mantua, renovated the cathedral, and designed the Church of San Benedetto. In addition, he completed a series of engineering works designed to eliminate the flooding of certain neighbourhoods of Mantua. Other notable schemes of Romano's later years are the decorations planned for the choir and apse of Verona Cathedral (c.1534, Scenes from the Life of the Virgin); a Nativity (1531, Louvre), painted for the Boschetti chapel in the Church of S. Andrea, Mantua; a series of mythological tableaux (Jupiter's Family), painted for the Duke of Mantua (National Gallery, London) and an important series of tapestry art commissioned by Francis I (History of Scipio, Louvre and Hermitage). Paintings by Giulio Romano can be seen in some of the best art museums around the world.  For more biographical details about famous Mannerist painters, see: Homepage.  For an evaluation of important Mannerist pictures, see: Famous Paintings Analyzed.